Shropshire’s out of hours GP cooperative, Shropdoc, has celebrated its 20th anniversary with a special charity fundraising ball. The celebratory dinner took place at Shrewsbury Town Football Club on Friday June 24, and raised nearly £400 for the Alzheimer’s Society. Current Shropdoc chairman, Dr Russell Muirhead, made the main speech to staff and assembled guests, while Dr Nick King, one of the original directors of Shropdoc, made the toast. Dr Muirhead said: “Our patients depend on Shropdoc and Shropdoc depends on everyone in our team. What we do is often complex and difficult and requires everyone to do their part of the job and to do it well. “I believe that our greatest strength is the sum of this joint commitment to do the best we can for our patients – that is the key element of Shropdoc’s success.” He went on to tell guests at the ball that he felt Shropdoc to be a highly successful organisation that is ready to face the challenges of the future. “Success is the confidence and high regard which our patients hold in us – illustrated only a few months ago by the support we saw when it was mooted that Shropdoc might go out to tender,” he added. Success is the consistent and repeated high levels of satisfaction which we receive from our patient surveys and feedback. “Success is having one of the highest access rates per patient in the UK – a double edged sword you may feel – but what it actually means is that Shropdoc patients don’t resort to 999 and A&E the way they do in other areas – we are a significant resource within the local health economy. Shropshire Doctors Co-operative Ltd (Shropdoc) provides urgent medical services for patients in Shropshire, Telford and Wrekin and Powys when their own surgery is closed and their needs cannot safely wait until the surgery is next open. It operates during evenings, over weekends and bank holidays. 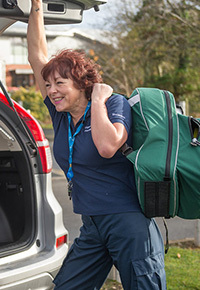 Shropdoc provides services to 600,000 patients in the region and the call centre deals with around 250,000 calls and in excess of 150,000 patients per year.